If I knew how to take a good photograph, I'd take one every time. Scenes like this must be appreciated as they are now impossible to duplicate. I'll say something outrageous here. 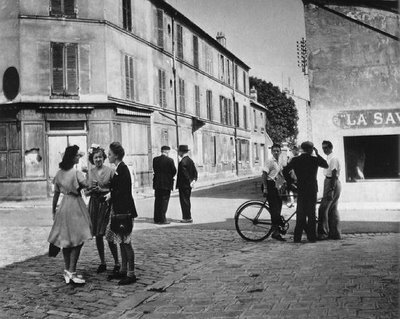 I think the impact of Bresson's work (and others)is more in the "way back time machine" appeal than for his actual talent. Susan Sontag says that every pic taken becomes art precisely for this "back in time" effect. Factual part dissapears, aestetic part remains. If Mr. Dosineau had used models for his street scenes, instead of relying on chance encounters, perhaps his photos would have been more widely enjoyed. With a sentence like that, I can only think this was a generous man.